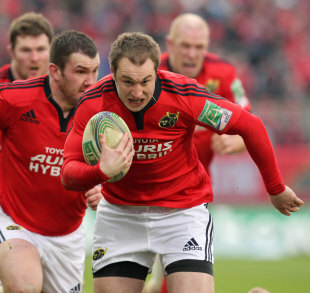 Munster have announced that five of their players have penned new deals with the Celtic league champions. Winger Johne Murphy, scrum-half Duncan Williams and prop John Ryan have all committed to new two-year deals with the Thomond Park side. And they are joined by Marcus Horan and Sean Scanlon in re-committing their respective futures with the duo both penning one-year contracts. And in addition JJ Hanrahan (centre), Dave O'Callaghan (wing-forward), Luke O'Dea (wing), Cathal Sheridan (scrum-half) and Alan Cotter (prop) have all made the transition from academy to development contracts. Munster have also announce the signing of former Ireland U19 flanker Sean Dougall on a one-year deal. The Rotherham Titans forward joins after previously turning out for the Ulster academy prior to his move to the Championship.